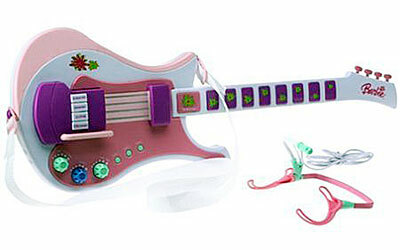 Barbie karaoke guitar looks and plays like a real electric guitar. Comes with a cartridge that plays top hits, with and without vocals. The freeplay option and automatic chords let kids rock out while accessories like the whammy bar and headset microphone add to the fun. Song cartridge includes three top hits to sing along to. Four modes of play allow kids to jam, strum, or play along karaoke style. Flower keypads produce different guitar riffs.